The Lodge, Perrycroft07858 393767work Self-cateringThe Lodge, Perrycroft – Charming Historic Cottage in Colwall in the Malvern Hills with Lovely Views. 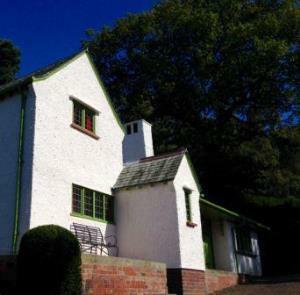 The Lodge was designed by the renowned Arts and Crafts architect CFA Voysey and built in 1895. It is the lodge house for Voysey’s Perrycroft, and stands at the top of the drive, with far reaching views across the rolling Herefordshire countryside and walks straight from the door on to the Malvern Hills. Visitors may also wander in the lovely gardens of Perrycroft at their leisure. Recently refurbished, the Lodge has been restored to its original appearance. The simple furnishings and colours used in the restoration reflect Voysey’s illustrations, with their white washed walls, green painted woodwork and red curtains. While providing modern essentials such as Wi-Fi internet, television, and a fully equipped kitchen, The Lodge will appeal to visitors in search of a peaceful and simple holiday home in an historic setting. There are two bedrooms, one upstairs with an antique king size bed and adjacent bathroom with cast iron roll top bath and antique wash stand, and the other downstairs with twin single beds and an en-suite shower room. The fifth good quality sofa bed is provided on request in one of the two sitting rooms. There is a large country kitchen and a spacious dining room with antique furniture and a wood burning stove. The two sitting rooms both have an open fire. One sitting room has the TV and DVD player, and the other a selection of games and books. The cottage has an enclosed garden and private parking for two cars. The Lodge, Perrycroft – Charming Historic Cottage in Colwall in the Malvern Hills with Lovely Views. The cottage is located between Malvern and Ledbury, on the B4232. Approaching from the South: From the A449 Malvern to Ledbury road, take the B4232 at British Camp (Jubilee Drive). The Lodge is 1 mile on the left. Approaching from the North: From the A449 at Great Malvern take the B4218 signed to Colwall. Continue to the top of the hills past the Wyche and take a left turn onto Jubilee Drive. The Lodge is 1 mile on the right.